Information for this list has been supplied by Dr. Danker Schaareman, with support from the American Gamelan Institute. Any questions regarding this information can be sent to the author at his email: danker@denpasar.wasantara.net.id. Published Recordings of Selunding Music. Below is a preliminary list of selunding orchestras giving such (very succinct) information on these as is known to me. The next update of this work on selunding in progress will be a short introduction to selunding music in general. I intend to add more information on the history of the villages and their orchestras later. 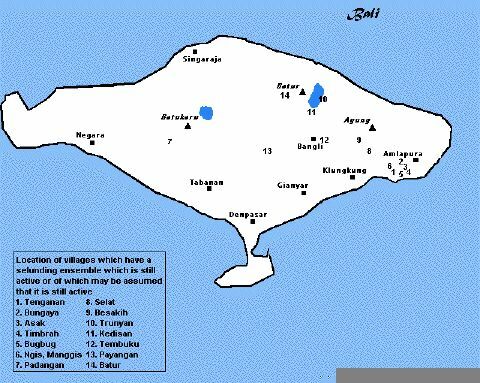 The villages which have or have had a selunding are listed alphabetically. The name of the district is added in parentheses. List A describes traditional selunding ensembles, whereas list B shows those orchestras which have been taken out of and are played outside their traditional setting. Thanks to Daniel Wolf, Charlie Richter, David Harnish and Loren Nerell for their input concerning list B. Depending on your point of view, Nrs. 28 (Payangan) and 40 (Tembuku) might be considered as being “out of context”, although I have left them on the first list. 1. Ababi, Banjar Bias (Karangasem) In 1978, 17 keys were found in a rice-field (cf. Bali Post 30-3-78 and 22-5-1978). According to the report in the Bali Post (22-5-1978) these were bronze keys, but the ones I have seen were definitely made of iron. The village regulations mention offerings for the “salunding”. Playtime: unknown. 2. Asak (Karangasem) Recorded (first in the nineteen-forties); film & video available. Full orchestra. Transcription(s) in Schlager 1976, Schaareman 1992 (see reading list) as well as in the text to “Ritual Music from Bali I” (see recording list). Playtime: Once a year during the Usaba Kasa, around the full moon of the first month (June/July). 3. Awan (Bangli) Keys only (33); the keys were dug out in a field in 1943. Playtime: unknown. 4. Batur (Bangli) Recorded in 1973. This is not possible anymore, so it seems. There are still people in Batur who can play, but these are not allowed to play because they belong to the kiwa (“left”) -half of Batur. Two instruments. Playtime: Usaba Kalima (fifth month, ca. November) and periodic large= rituals. 5. Bayung Gede (Bangli) Not active; keys only? Playtime: it was reportedly played during rituals in the fourth and tenth months (usaba gede). 6. Bebandem (Karangasem) Mentioned in a prasasti (edict) only (Saka 1068?). Playtime: unknown. 8. Blancang (Bangli) Extinct. Reportedly there has been a selunding orchestra in this village in former times. Playtime: unknown. 9. Buahan (Bangli) Not active; there seem to be some instruments which are broken down. Mentioned in a prasasti of Saka 1103. Playtime: Fourth month (Kartika)? 10. Bugbug (Karangasem) Recorded; video available; full orchestra. Playtime: Once a year during the Usaba Kasa, around the full moon of the first month (ca. June/July). Transcriptions in Schlager 1976 (see reading list). 11. Bulian (Buleleng) Mentioned in a prasasti only (Saka 1103). Playtime: unknown. 12. Bungaya (Karangasem) Recorded in the nineteen-forties and 1985. Full orchestra. Playtime: I witnessed it being played during the maligia in the Karangasem puri kangin; otherwise once in ten years. Transcriptions in Schlager 1976 (see reading list). 13. Bunutin (Bangli) Not active, most likely extinct. The reported selunding ensemble here appeared to consist of one iron “kaling” (a kind of jar). Nevertheless, it was maintained that there had been a selunding orchestra in former times. Playtime: unknown. 14. Campetan (Bangli) Mentioned in a prasasti (Saka 1071?). Playtime: unknown. 15. Cempaga (Buleleng) Not active; extinct? Mentioned in two prasasti’s (Saka 1103 and 1246). According to the village regulations (awig-awig) there ought to be four wooden troughs. There are no musicians any more. Playtime: unknown. 16. Geliang (Karangasem) Not active and probably extinct. It was reported that there were a selunding here, but I have not been able to discover it. Playtime: unknown. 17. Jagaraga (Buleleng) Mentioned in a prasasti only. Playtime: unknown. 18. Kayubihi (Bangli) Not active? In the early nineteen-seventies there were still some musicians, but I haven’t been able to record the ensemble then. The keys are buried after rituals are completed. Playtime: unknown. 19. Kedampal (Karangasem) Recorded in 1972-73, now supposedly inactive. Two instruments. Playtime: full moon rituals. 20. Kedisan (Bangli) Extinct or just not active? Reportedly two instruments with ten keys each. Playtime: full moon of the tenth month (Kadasa). 21. Kengetan (Gianyar) Not active; keys only? According to Kunst (1925) there were 3 instruments. People in the village do not know of a selunding, and suppose it got lost in 1965. Playtime: unknown. 22. Kintamani (Bangli) Not active; extinct? Reportedly there are keys. Playtime: unknown. 23. Landih (Buleleng) Mentioned in a prasasti only (Saka 1103). Playtime: unknown. 24. Ngis, Manggis (Karangasem) Recorded in 1972-73. Full orchestra Playtime: Usaba Kapat at the time of the full moon of the fourth month (ca. October); Galungan. Transcriptions in Schlager 1976 (see reading list). 25. Padangan (Tabanan) Full orchestra has ceng-ceng, kendang and “gender” added to it. Playtime: depends on village priest. 26. Pamuteran (Karangasem) Not active; two instruments with ten keys each. The orchestra is mentioned in a prasasti of Saka 1306. Playtime: unknown. According to the prasasti the ensemble played during the full moons of the third and tenth months as well as during the time of the waning moon of the fourth month. 27. Payangan (Gianyar) Reportedly the village once possessed a selunding orchestra. Playtime: unknown. 28. Payangan (Gianyar) There is a new ensemble in Payangan, built after the Tenganan orchestra; inspired by Bob Brown. Playtime: not know to me. 29. Pedawa (Buleleng) Not active. Only one instrument, called “serunding”. Type: gangsa jongkok! Playtime: unknown. 30. Perasi (Karangasem) Recorded in 1974; only some instruments remain now. Playtime: children bang on the instruments during rituals when the orchestra is ritually set up in the main village temple. 31. Pura Kehen (Bangli) Mentioned in a prasasti only (Saka 1126). Playtime: unknown. 32. Selat (Karangasem) Recorded; film available. The sekaha seems to be growing (in 1985 it the orchestra was played by one village priest who handled several instruments at the same time!). Transcriptions in Schlager 1976 (see reading list). Playtime: during main village rituals. Main rituals are: Usaba Emping (full moon of the second Balinese month); Usaba Agung (full moon of the third month); Aci Ngasanga (full moon of the ninth month); Usaba Padikitan (new moon of the ninth month); Usaba Miyik (full moon of the fourth month); Usaba Kadasa (full moon of the tenth month); Usaba Ngatelun (nagingin pulu). 33. Sembiran (Buleleng) Reportedly! Playtime: unknown. 34. Serai (Bangli) Only one key remains. The orchestra as such is mentioned in a prasasti (Saka 1103). Playtime: unknown. 35. Seraya (Karangasem) Slightly mysterious. Some people say that there is or has been a selunding orchestra, others deny it. Playtime: unknown. 36. Songan (Bangli) Extinct. The village possessed a selunding orchestra in former times, but it was said that the iron keys had been used for making a gong orchestra. NB: A gong orchestra has usually bronze keys, but I have found several gong orchestras with iron keys instead in Lombok (iron is cheaper than bronze). But at any rate there is no orchestra with iron keys in Songan nowadays. Playtime: unknown. 37. Sulahan (Bangli) Extinct. According to people in Sulahan the village possessed a selunding orchestra a long time ago. The story is that it became obscure and was replaced by a Semar Pagulingan; only after that did the village obtain its now famous gong gede orchestra. Some people say that the gong gede has always been in Sulahan, but there is also a story according to which the orchestra was given to Sulahan by the king of Bangli in return for its help in the war against Klungkung (in which Klungkung was defeated). Playtime: unknown. 38. Teba Kauh (Gianyar) Extinct; mentioned only in two prasasti’s. Playtime: unknown. 39. Tejakula (Buleleng) Extinct. Mentioned in a prasasti only (Saka 1077). Playtime: unknown. 40. Tembuku, desa Bambang (Bangli) New orchestra, made about a couple of years ago after the one in Tenganan. The teacher is a graduate from the STST, coming from the village of Bambang. Playtime: during temple ceremonies. 41. Tenganan (Karangasem) Three full ensembles, belonging to Tenganan kelod, tengah and kaja, resp. Playtime: often during village rituals. Transcriptions in McPhee 1966, Schlager 1976 and Ramseyer 1992 (see reading list). 42. Tigawasa (Buleleng) Not active. There must have been four wooden troughs; only two remain. Playtime: unknown. 43. Timbrah (Karangasem) Recorded in 1973. Full orchestra. Transcriptions in Schlager 1976 (see reading list). Playtime: Usaba Karo during the second month (ca. July/August). 44. Tista, Banjar Carik (Tabanan) In 1979 104 iron keys were found (cf. Bali Post, 29-1-1979). Playtime: unknown. 45. Trunyan (Bangli) Two instruments; I am not sure whether it is still played during rituals or not. Playtime: Usaba Kapat, i.e. during the time of the full moon of the fourth month (ca. October). I only know of a fragmentary transcription by Walter Spies (see reading list). 46. Tumbu (Karangasem) Only some wooden troughs and keys remain. An old woman told me in 1988 that she had heard the orchestra play “40 years ago”; there were six players then. Playtime: unknown. 47. Basel (Switzerland) Two orchestras, built after a) Tenganan and b) after Bungaya. They belong to the Music Academy and the Museum of Ethnography resp. Playtime: occasionally. 48. Denpasar (Badung) STST copy of the Tenganan orchestra. Playtime: used for educational purposes and composition. 49. Los Angeles (USA) Tenganan model; brought to Los Angeles by Bob Brown. Playtime: unknown. Boekian, I Dewa Poetoe. 1936. “Kajoebii: een oud-Balische bergdesa”, in: Tijdschrift voor Indische Taal-, Land- en Volkenkunde 76. Korn, V.E. 1933. De dorpsrepubliek Tnganan Pagringsingan op Bali. Santpoort. Kunst, J. & Kunst-v. Wely, C.J.A. 1925. “De toonkunst van Bali II”, in:. Tijdschrift voor Indische Taal-, Land- en Volkenkunde, 65, 3. Weltevreden: Albrecht. McPhee, Colin. 1966. Music in Bali: A Study in Form and Instrumental Organization in Balinese Orchestral Music. New Haven & London: Yale University Press. Nakamura, Kiyoshi. 1992. “Articulating Rituals. The Use of Ritual Music in Selat (Karangasem)”, in Schaareman (ed.) 1992. Ramseyer, Urs. 1983. Bali, Distrikt Karangasem – “selonding”- Orchester. Ritualmusik in Tenganan Pegeringsingan. Publikationen zu wissenschaftlichen Filmen, Sektion Ethnologie, Serie 13, Nr. 6, Film E 2167. Goettingen:Institut fuer den Wissenschaftlichen Film. Ramseyer, Urs. 1992. “The Voice of Batara Bagus Selonding. Music and Rituals of Tenganan Pagringsingan (translated by Cressida Joyce)”, in Schaareman (ed.) 1992. Schaareman, Danker. 1977. Ritual und Musik in einem balinesischen Dorf. Unpublished MA Thesis, University of Basel. Schaareman, Danker. 1980. Taenze und Opferhandlungen waehrend des Sumbu-Festes in Tatulingga (Distrikt Karangasem, Bali). Publikationen zu wissenschaftlichen Filmen, Sektion Ethnologie, Serie 10, Nr. 21, Film D 1321. Goettingen: Institut fuer den Wissenschaftlichen Film. Schaareman, Danker. 1990. “The Power of Tones: Relationships between Ritual and Music in Tatulingga, Bali”, in:. Indonesia Circle 52. Schaareman, Danker. 1992. “The Shining of the Deity. Selunding Music ofTatulingga (Karangasem) and its Ritual Use”, in:. Schaareman (ed.) 1992. Schaareman, Danker (ed.). 1992. Balinese Music in Context. A Sixty-fifth Birthday Tribute to Hans Oesch. Winterthur: Amadeus-Verlag [Forum Ethnomusicologicum, Basler Studien zur Ethnomusikologie, Band 4]. Schlager, Ernst. 1976. Rituelle Siebenton-Musik auf Bali. Herausgegeben von Hans Oesch. Bern: Francke Verlag. [Forum Ethnomusicologicum, Series I: Basler Studien zur Ethnomusikologie, 1]. Spies, Walter. 1933. “Das grosse Fest im Dorfe Trunjan (Insel Bali). Tagebuchblaetter, in:. Tijdschrift voor Indische Taal-, Land- en-Volkenkunde 73. Team Survey Guru-Guru KOKAR. 1972. “Gamelan Selonding”, in: “Musika, brosur mengenai ilmu musik dan koreografi, 1.” Jakarta: Lembaga Musikologi dan Koreografi. Only the first two recordings contain exclusively selunding music. The other CDs and LPs (discs) have selunding music among other musics from Bali. Nrs. 1, 2, 3, 6 and 7 have selunding music from Tenganan; nrs. 4 and 5 from Asak (also east Bali). CD. Selunding by the Sea. Aman 001CD. Recorded and produced by Douglas Myers. LP. 1960. Gamelans de Bali. Musique des dieux, musique des hommes BAM, LD096M. Text and recordings by Louis Berthe. LP. 1985. Ritual Music from Bali I. The Annual Cycle in Tatulingga: The Usaba Sumbu. Musicaphon, BM 30 SL 2570. By Danker Schaareman. LP. 1986. Ritual Music from Bali II. Cross-section through the Music of the Annual Cycle in Tatulingga. Musicaphon, BM 30 SL 2571. By Danker Schaareman. CD. 1991. The Gamelan Music of Bali. King Record Co. LTD, Japan (KICC 5126). CD. 1995. Traditional Musicians. A Suite of Tropical Music and Sounds. WDR World Network, Best.-Nr. 58.397. Text by Wolfgang Hamm and Rika Riessler, recordings by Wolfgang Hamm and Radu Marinescu.